Tagged under Seven Arcs, Series, Drama CD, Lyrical Nanoha. While on her way to school Nanoha Takamachi, a third-grade elementary student, stumbles upon an injured ferret-like animal wearing a bright red stone. She leaves him in the care of a local veterinarian and happily plans on adopting a new member to the Takamachi family. That night, a mysterious voice calls out beseeching her help. Nanoha races over to the veterinarian's office to find the very same animal being chased by a dark moster. After being rescued for the second time, the ferret asks Nanoha to use his magical power to stop the dark monster. He hands her the red stone and asks her to repeat a magical incantaion. The stone begins to glow and Nanoha magically receives armor and a magical staff transformed from the very stone she was holding. Nanoha ungracefully, yet instinctively uses her new found powers to defeat the monster. After the battle the ferret identifies himself as Yuuno Scrya, the red stone as Raging Heart, and the origin of the monster as a Jewel Seed. Yuuno explains that the Jewel Seeds are ancient relics of his world that are uncontrolled magical stones that sometimes become unstable and become like the monster from the previous battle. 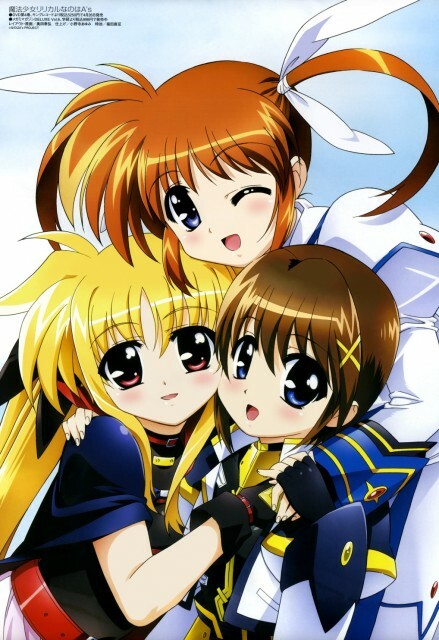 After hearing the history of the Jewel Seeds, Nanoha agrees to continue looking for the Jewel Seeds with the help of Raging Heart and Yuuno. Her decision leads her towards more hardships, battles, and a shadowy, young mage with long blonde hair called Fate Testarossa. - This is a tag for the first two Nanoha Series. Alternative retelling movies/video games that shared the same timeline will be merged here. Being a show in the magical girl genre is hard. It risks being compared to the epitome of that genre (in my opinion of course) Cardcaptor Sakura, or written off as just some other show meant to appeal to girls and fanboys in their mother's basement. Nanoha takes all those preconceived notions, throws them out the window and deals with them with a divine buster (one of Nanoha's biggest attacks). We aren't talking chasing the wood card here, or using the power of the wand of Pegasus to stop the bad guys stealing hearts; we are talking little girls beating the hell out of one another... a lot. I would actually venture to say that this trumps Cardcaptor Sakura in this genre and easily takes the top of it. CCS was a fun ride but it was long and didn't really hit big until the end. I went into this with limited expectations and was very pleasantly surprised at how good it was. Honestly, I consider it one of the best shows of its type out there, and I somehow managed to grab the box set for $20 relatively early on, but didn't get a copy of the A's box set before it shot up in price. I doubt I'll ever see it at a price I'm willing to pay, but stranger things have happened. Nice magic effect on graphic. I love each character's uniform during transformation. There are very cool and beautiful design. Honestly, I prefer Fate Testarossa more than Takamachi Nanoha. Hope I can see more story about Nanoha and Fate. skipped season 1, season 2 and season 3 pretty good. lots of characters with lots of relationships. luckily, they are developed and insights were revealed. characters shared their highs and lows with us. seiyuu solid and strong performance added value. songs are pretty well written and performed. artworks quality considered as high for many years to come. the scenes with lots of magic fights involved are well layout and spectacular. Whoo! This is a -fun- one! By far the most -epic- magical girl series I've ever seen, -bar none-. It's a -lot- better than the title suggests. Believe me, the title put me off from the series, too, but once I sat down and actually watched it...! Seriously, it's mind-blowingly awesome! When I first heard about this, I thought it was just a typical "magical girl" anime, but this series proved me wrong entirely. To my name, i've seen the 1st & second seasons, and haven't quite finished StrikerS yet. But definitely a series to see. The first season is not that likable to everyone since it turned out to be just your typical mahou shoujo anime. But, that doesn't cut it. Indeed you have to watch the first season because it is a technicality to the story, but with its predecessors, A's and StrikerS I'm sure, you'll get addicted. Followed by the stories of the Drama CDs, you will surely get hooked.